Now, where did I put the marshmallows? This week’s Thursday Writing Prompt is about writing fantasy. The problem with writing fantasy, science fiction — or any kind of fiction, for that matter — is making your setting believable. Fantasy comes with some heavy baggage: say the word and people will already be thinking about castles, dragons, fairies, elves, and all the assorted characters found in works as diverse as Lord of the Rings and Dragonheart. For instance, your reader’s preconceived notions about what a dwarf should look like, or what kind of work he does, can work with you or against you when you’re writing a story. 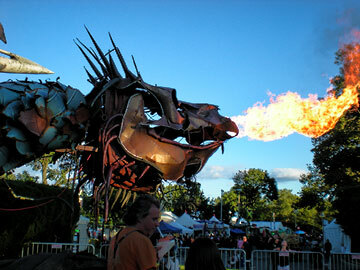 Writing dragons is a bit more flexible, but readers will expect that the dragon should be able to fly and breathe fire. How you get it to do that is up to you! But this is what makes writing fantasy difficult, because while the readers for your dragon story are going to have some built-in expectations, you can’t just get lazy and let them fill in all the blanks when it comes to detail. Here’s where you need to do some work and come up with something unique. It’s a bit like cars: we expect them to have four tires, brakes, a steering wheel, and a driver’s seat, but beyond that we’re open to interpretation. To make the dragon yours, you need to work with the “necessary” ingredients that the dragon should have and then add a twist or give the dragon some other personality trait. For this week’s exercise, you’re going to sketch out a dragon. I don’t mean sketch as in drawing it, although if you are artistically inclined then go ahead and come up with a picture before you start writing. What you will do is essentially write a short “encyclopedia entry” of your dragon, in which you describe its lifecycle, what it looks like, whether or not it breathes fire or spits acid, and more. Start with an outline if it makes the task easier for you. Your dragon’s description should include enough information for you to write a short story or a novel without having to stop somewhere in the middle and think about whether or not your dragon can do a certain thing. Have some fun with this, and try to come up with some workable ideas for a story.